We had the wonderful opportunity to join 250+ teen girls from Houston-area schools for the NFL Women’s Summit held at Super Bowl LI. It was a beautiful experience to see so many young women from diverse backgrounds come together for a day of uplifting and bonding with one another. The NFL Women’s Summit is an interactive experience for young women to discuss how to achieve goals, prepare for challenges, and utilize tools critical for personal and professional development. 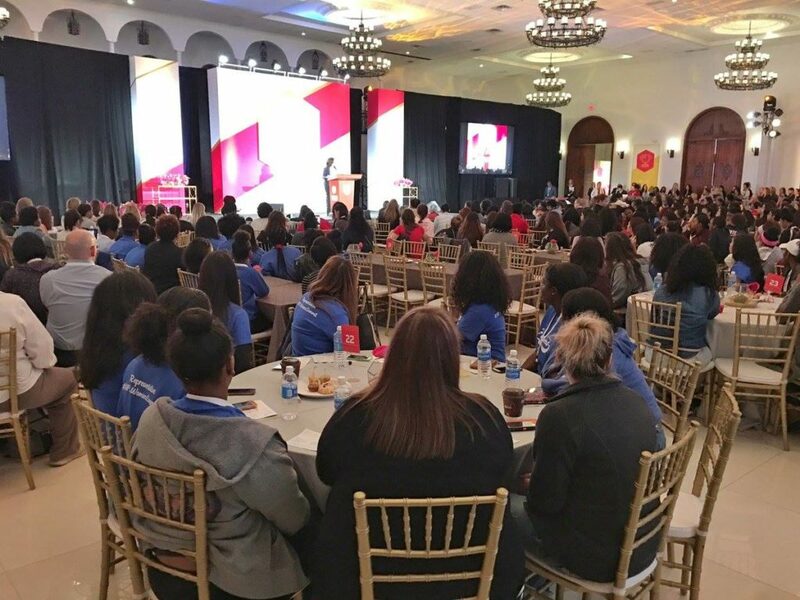 The two-day summit (which was also live-streamed online via MAKERS, and NFLWomensSummit.com), offered the opportunity for teen girls to hear from a variety of inspiring speakers, learn new career ideas, and understand the tools for success, as well as fostering important discussions surrounding career paths, mentorship, and finding your voice. 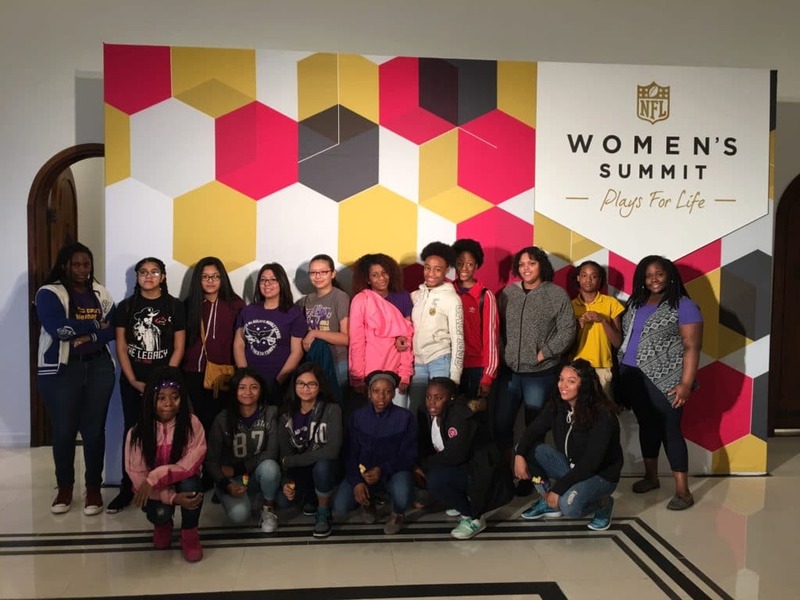 Teen Girls from Christa McAuliffe Middle School in Houston at the NFL Women’s Summit 2017. NFL Commissioner Roger Goodell welcomed attendees while discussing the importance of mentors. He told the audience, “It’s critically important to find a group of diverse people who will support you but won’t tell you what to do…that’s for you to figure out”. He also noted, “I still have mentors, younger and older, who can provide a different perspective.” This remained an important message throughout the day, with various speakers speaking about the important role that mentors had played in their lives. The Women Summit also featured other young women panelists and guest speakers, where it was evident that the attending teen girls got specially inspired by them. 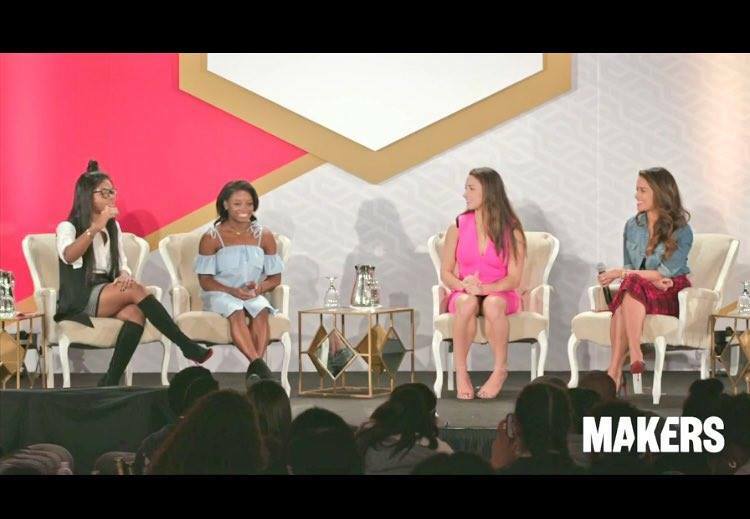 Teen girls including 16yr-old singer, actress, dancer, and model Jordyn Jones, twin singers Chloe X Halle Bailey (whom are lucky enough to be mentored by none other than Beyonce), and “NFL PLAY 60 Super Kid” Sophie Schneider shared their stories of what fearlessly going towards your dreams looks like at a young age. Olympic USA gymnast Gabrielle Doug in a panel inspiring young women to play BIG in life at the #NFLWomensSummit during Super Bowl weekend. The Take Action: Impact + Social Change Starting Now panel included Hannah Alper, Maya Penn and Erin Schrode who are wonderful role models for young girls. They eloquently shared about how you can make a positive impact regardless of your age while sharing their own personal stories. Eco-activist Hannah Alper, who’s also a blogger at Call Me Hannah, kicked off the panel by telling attendees, “You’re never too young to change the world!”. During the panel, she addressed some of the prejudice that she faced because she was so young, and how she overcame it by staying focused and learning as much as she could about topics she was passionate about. Maya Penn, a 16-year-old CEO, designer and activist and founder of Maya’s Ideas, talked about how she wanted to do something that would make a positive impact on the world. She said, “It’s so important to use your gifts to do something that inspires others”. She also talked about how when you’re making a difference, there will always be people who will be critical, “When you follow your passion, you’ll always have naysayers”. Erin Schrode, a 25-year-old next generation social entrepreneur, environmental and human rights activist, Democratic Party Congressional candidate and co-founder of Turning Green shared how she found her passion when her mom was diagnosed with breast cancer. In the Career Showcase: Anything is Possible panel, a group of diverse and accomplished engineers, and an astronaut talked about the importance of letting yourself make mistakes, learn from them and (quickly) get back on track. 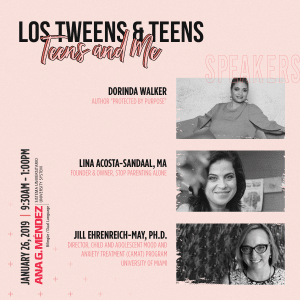 The idea of dwelling on mistakes – or not trying at all due to fear of “blowing it up” – were two big lessons that the accomplished panel shared with the teen girls. “I think of the hard days as the best days, you have to push through the bad to get to the good. There’s a lot to be learned from making mistakes!” – said Tracy Caldwell Dyson, chemist and NASA astronaut. The idea that making mistakes is actually a good thing stems from the fact that through mistakes we build character, resilience, compassion for ourselves and push even ourselves even further next time. At the end, are the challenging moments that make us stronger and invites us to search deep in ourselves to reach our highest potential. So yes….making mistakes (and recoving from them) IS one of the keys for playing BIG in life! You can watch recap videos, read speaker bios and event photos visiting: nfl.com/womenssummit and join the conversation at #NFLWomensSummit and #NosUne. This entry was posted in Mentors4Teens, Videos and tagged mentors4teens, mentorship. Bookmark the permalink. That’s right: Making Mistakes is Good, Experience is making mistakes and learning from them. What a great event! full of life experiences to learn from. These are some truly amazing and inspiring young women. I totally agree that you are never too young (or too old) to change the world. That´s so cool and fun for the girls. Glad they have the chance to enjoy an event like this. Great Initiative and event for girls! Thanks for sharing the info. 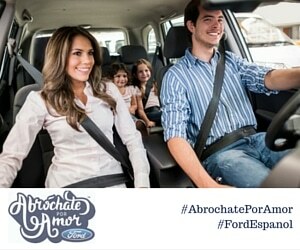 Que buena iniciativa para las chicas!!! Herramientas como estás hacen falta!